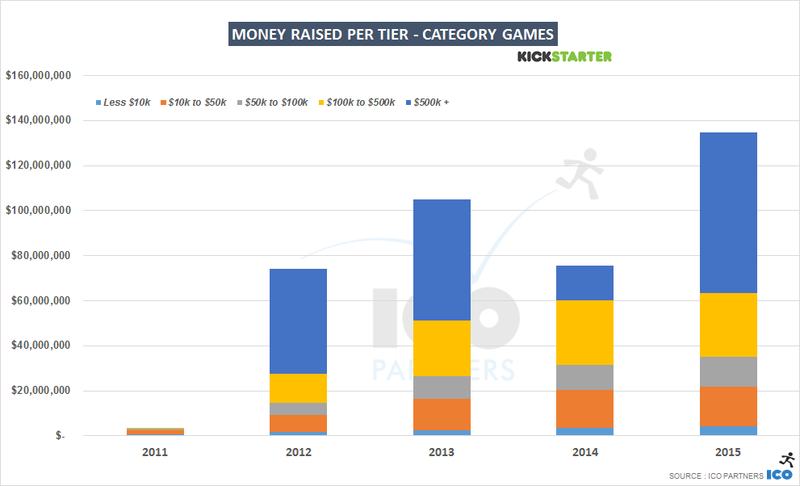 As promised, this is the second part of me looking at the past year and Kickstarter, this time looking at games and only games. It might help for a more general context to have a read of the previous post on Kickstarter as a whole for last year. Like in that article, you can find a fairly substantial deck with slides at the end for you to look at all sorts of numbers on that category. 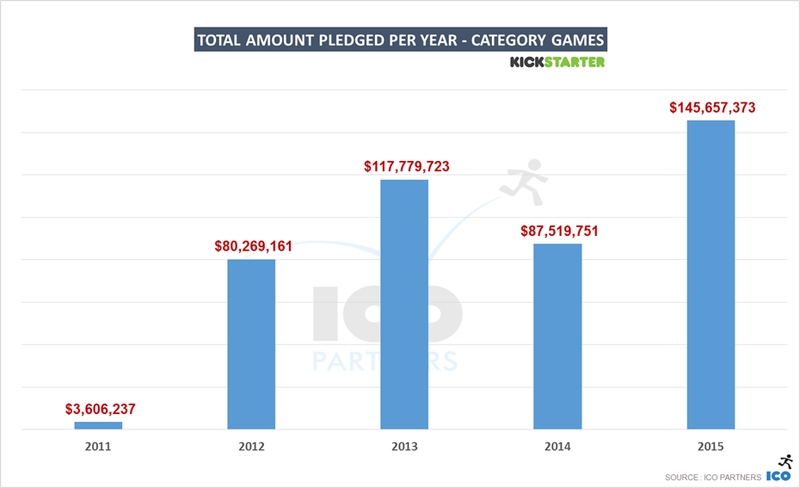 Overall, last year was really a good year for games on Kickstarter. As we saw, it was one of the 3 categories that really pushed the growth of the platform. 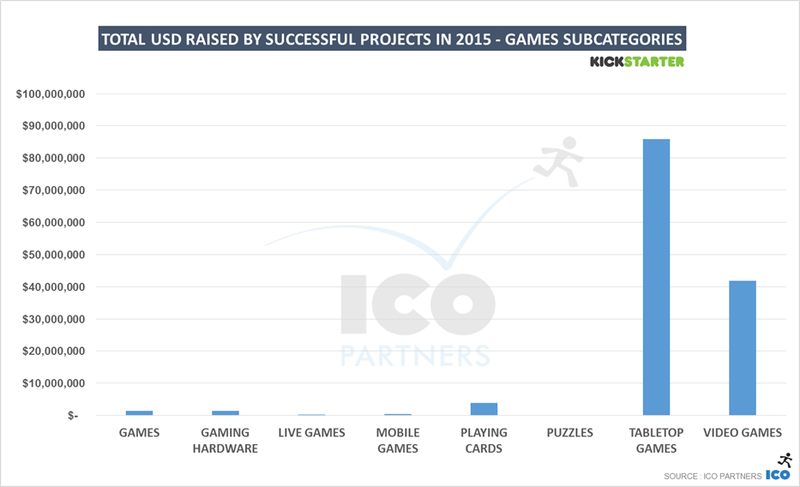 From a financial point-of-view, the Games category raised 78% more money than in 2014. And even compared to the previous record, 2013, this is a 30% increase. All around, a very strong year in that regard. What is also very good is that the total number of projects that got funded is also increasing. The growth is of 14% from the previous year. 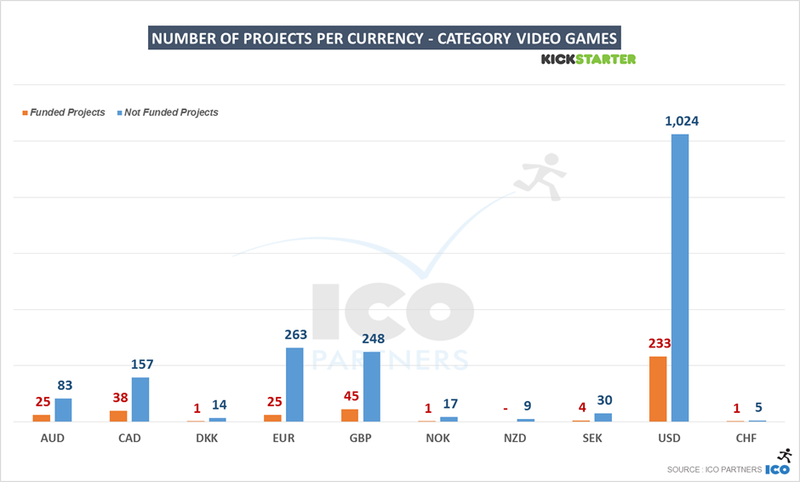 The total number of projects itself is growing much faster, but again, that’s in line with the trend across the board on the platform, and the fact that the growth of funded projects doesn’t follow at the same pace is not necessarily a bad thing – the quality of projects is not necessarily there to justify it. It is also an healthy sign that the financial growth happens across the tiers. It is easy for a few very large projects to carry that growth all by themselves, and while they obviously play a big role, they aren’t the only reason. I will do a quick overview on Games (the generic subcategory), Gaming Hardware, Live Games, Mobile Games, Playing Cards and Puzzles, before delving in Tabletop Games and Video Games, each one having its own part. 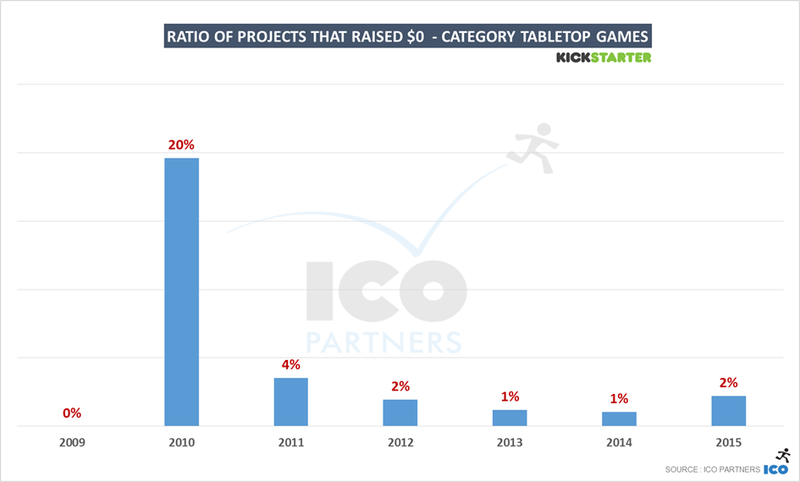 The Games, Gaming Hardware, Live Games, Mobile Games, Playing Cards and Puzzles subcategories, all taken together, represent 497 funded projects for last year, and $7.5m raised. 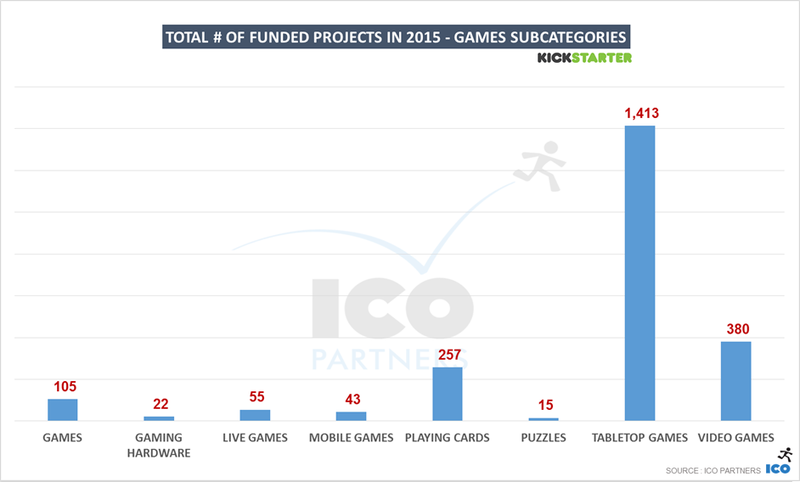 That’s 22% of all the Games category funded projects and 5.5% of the money raised there. It doesn’t mean those subcategories are not interesting, there are many things happening around them still. The Games subcategory is a bit of pot-pourri, gathering all the odd projects that the other subcategories didn’t represent properly, in the mind of the creator. There are a surprisingly high number of Pen & Paper roleplaying games in there, despite being usually associated with Tabletop Games. There is not much to say on the trends in that regard. It seems that the addition of more subcategories that happened in 2014 has reduced the number of “orphan” projects that were ending there. There hasn’t be a “homerun” gaming hardware in quite a while. Still, 5 projects last year managed to raise between $100k and $500k, led by the FOVE VR device. 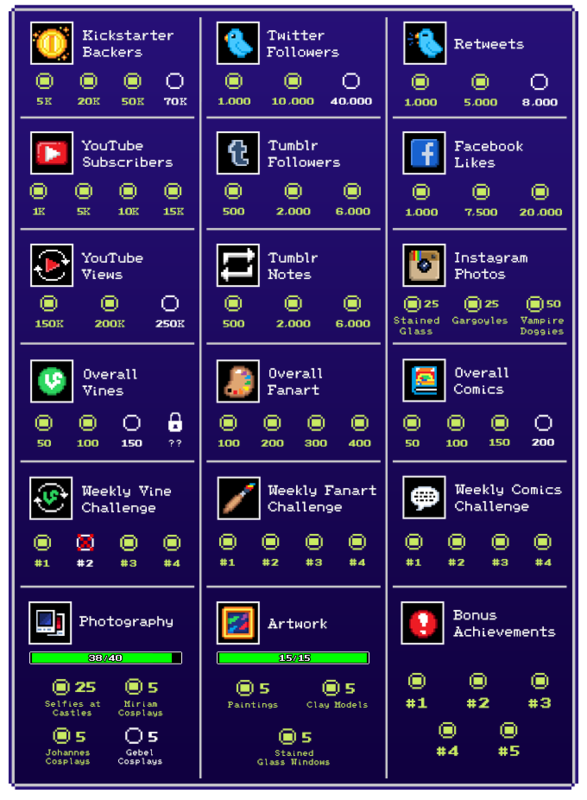 This is a niche, and I suspect a number of creators actually choose to list projects that could fit here in the Technology category. 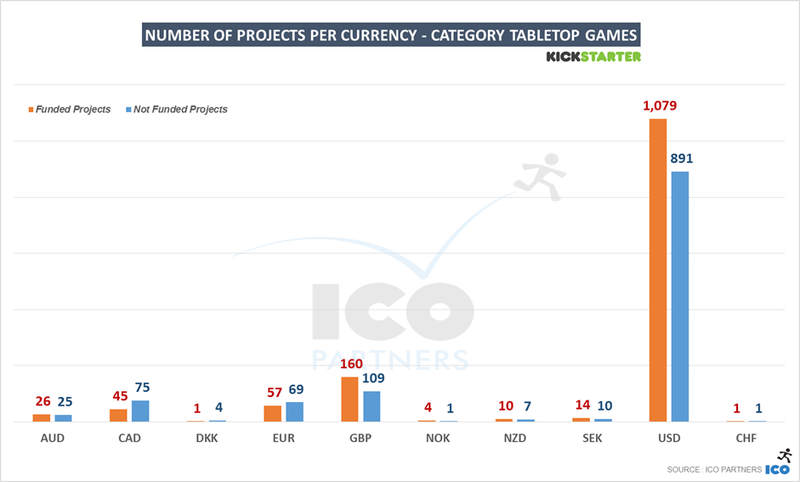 I noted that the 3rd currency for Live Games is the Swedish Crown, behind the US dollar and the British Pound. LARP is strong up North I hear. In itself, this is fine, but I think this is often something that people are just not aware, and they try to fund project of a scale comparable to the PC video games projects they see mentioned in the media. Finally, Puzzles is a very niche segment overall. We are talking 15 projects funded last year, the same as in 2014. None of those raising more than $50,000. 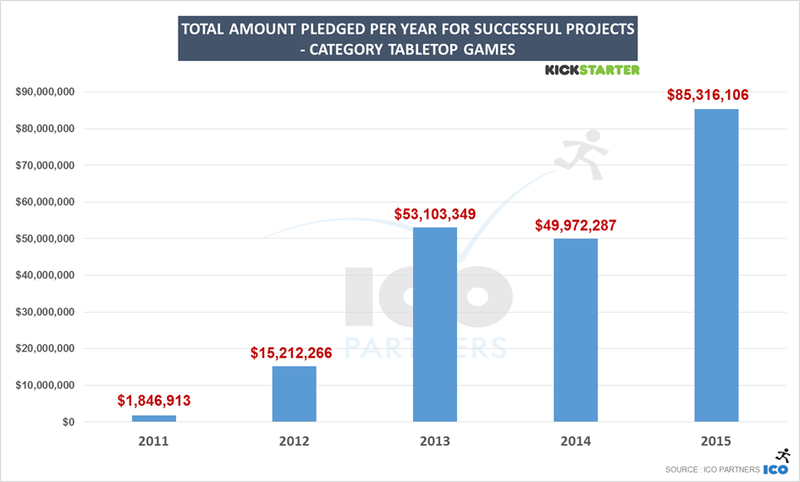 It seems fair to say that board games are doing incredibly well on Kickstarter. I would love to see some industry-wide numbers, but I wouldn’t be surprised if crowdfunding was a notable portion of those. 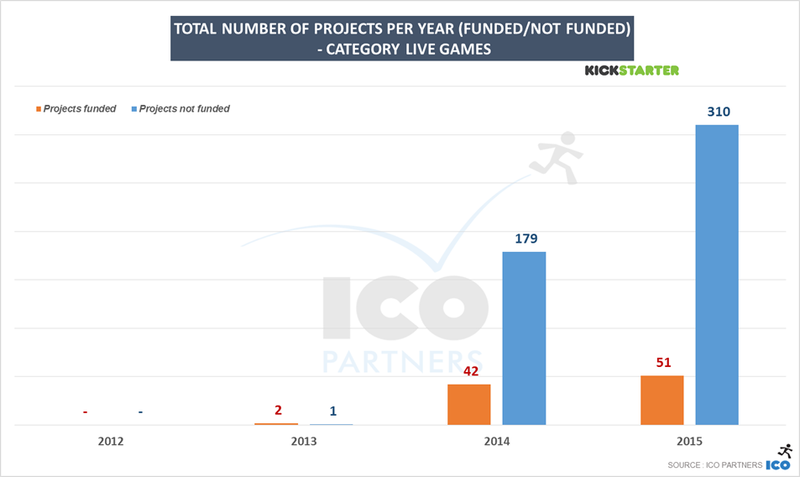 So, not only 2015 was a great year financially, with a significant growth from 2014, but also the best year to date, it was also a good year for the total number of projects that got funded. also an all time high and in constant growth since the launch of the platform. 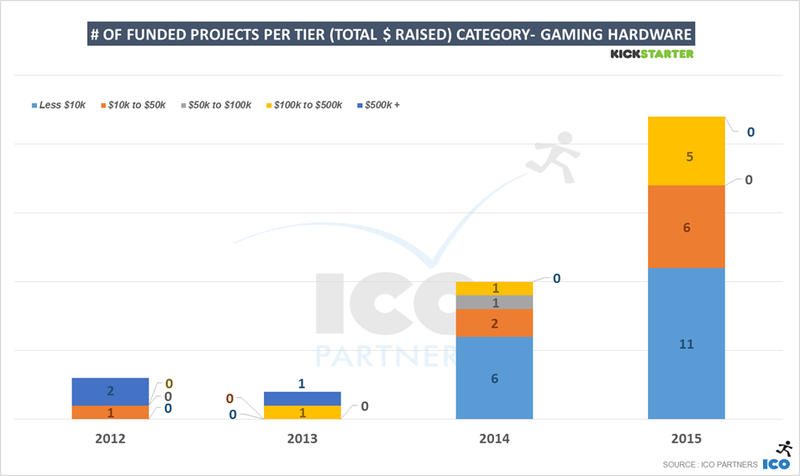 Again, looking at the amount of money raised for each “tier” of project, this is a very healthy trend: there has been more money across all the tiers. the large projects weigh heavily, but that doesn’t mean we have an issue of a growth happening only from the top. 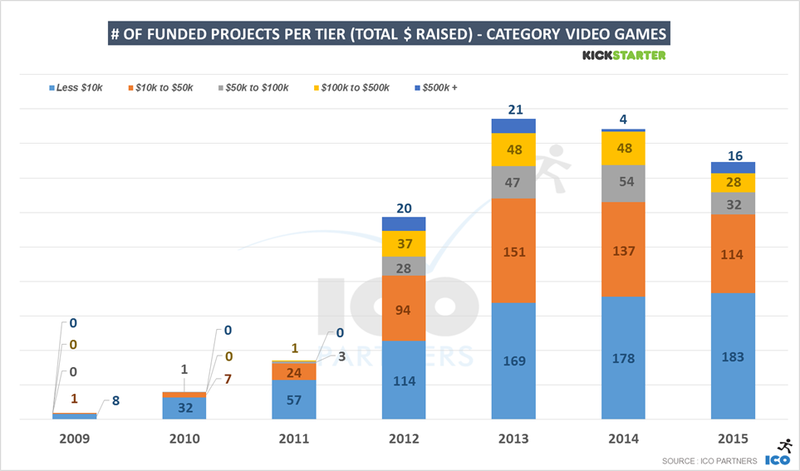 Doubling on the previous statement, more projects got funded on all tiers. There are many stories that projects need to be released in USD on Kickstarter to get funded. And while there is a high ratio of funded project there, I suspect the rumours are pushing a confirmation bias. Well, actually, projects in GBP have a higher success rate. Good job on the British tabletop industry! Trying to find anything to compensate those excellent trends, I wanted to share the ratio of $0 projects (my junk ratio) and the number of projects that got suspended by Kickstarter. 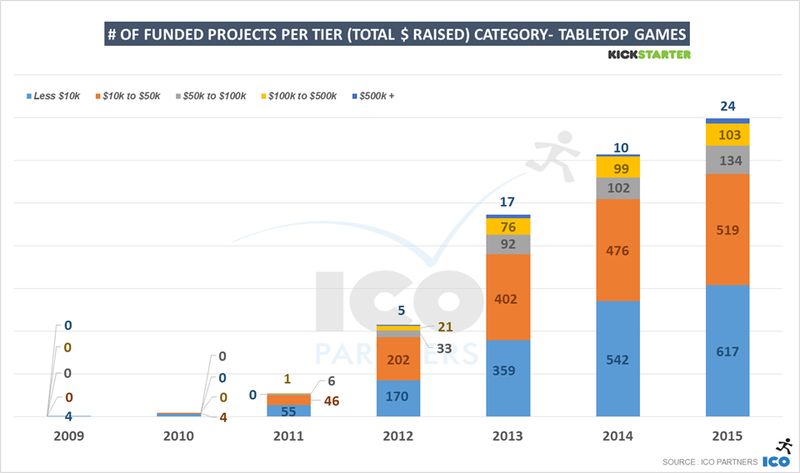 In both cases, the tabletop subcategory is actually performing very well. 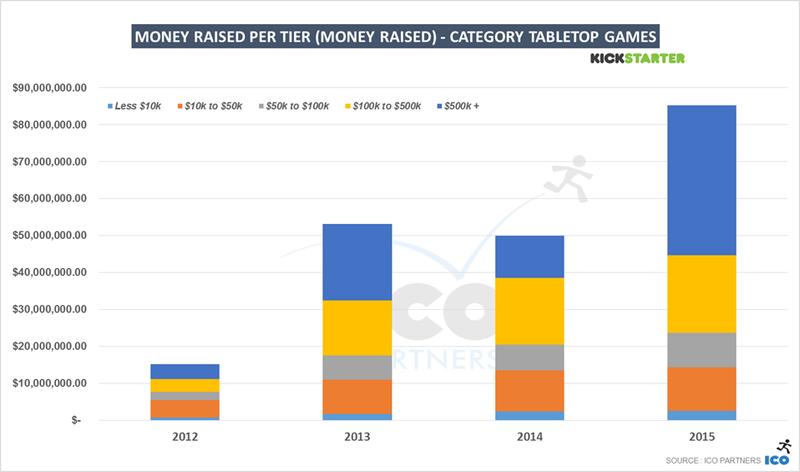 2015, officially the best year ever for boardgames on Kickstarter. 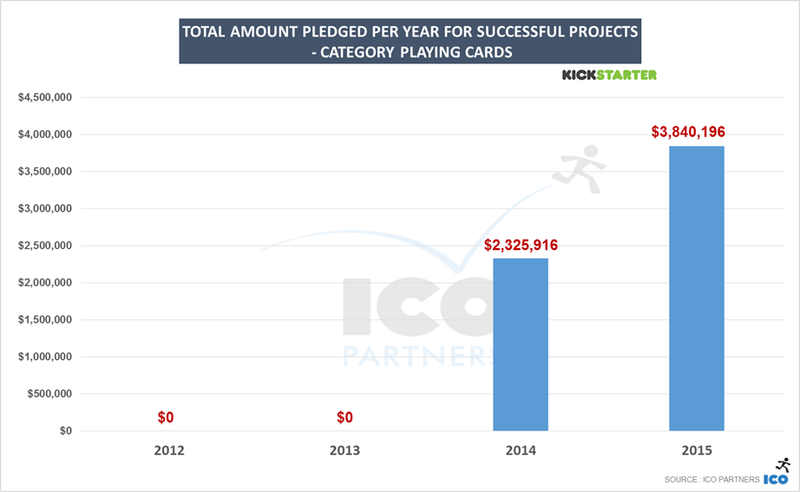 This is the 2nd year in a row that we see fewer projects being funded on Kickstarter. There is no sharp drop, so this well be the system being refined and the communities being more demanding in terms of quality before funding projects. 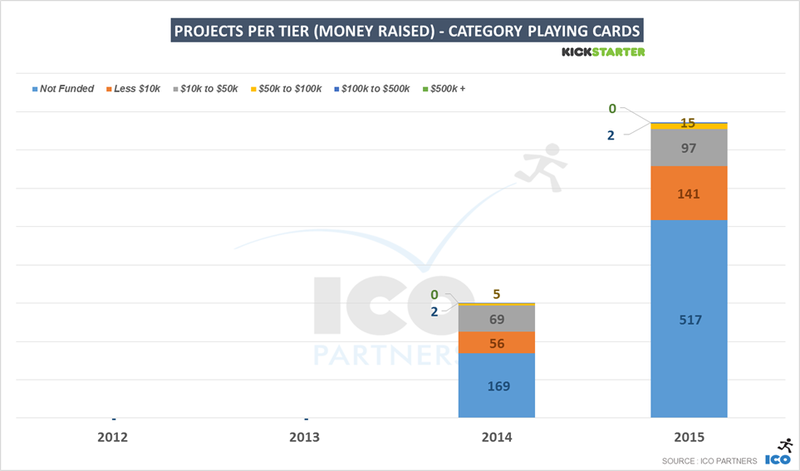 The range of projects that are less common from 2014 are the $10k-$50k and the $50k-$100k ones. We keep seeing a growth of the very small projects, year-on-year, though. There are more projects than ever trying their hand at getting funded on the platform though. 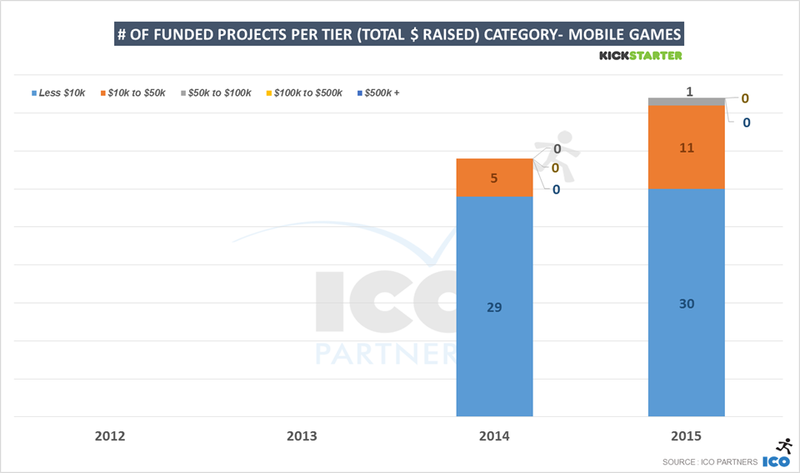 I suspect the quality bar to get funded is just getting higher. For most projects, it now necessary to have a demo of the game already available and the ability to show a rather advanced stage of the development process, much more so than in 2013. The fact is also that video games projects don’t scale the way board games to. 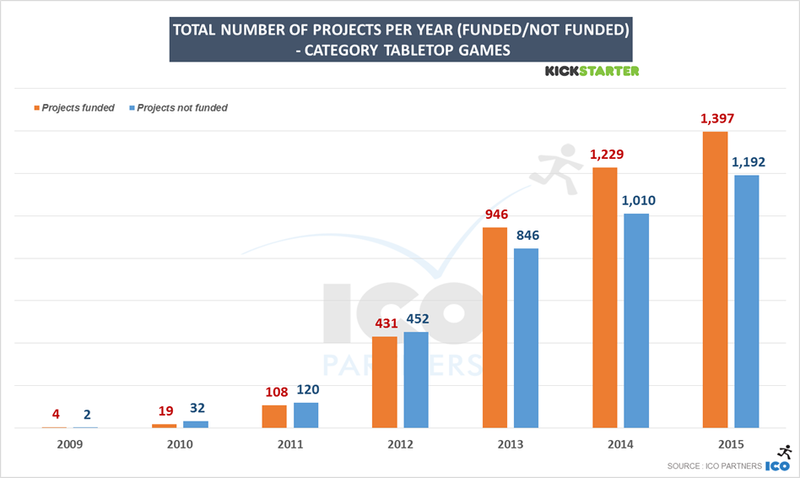 The average for a funded Video Games project is $43,000 while the average goal for a funded Tabletop Games project is $9,700. There are many differences in the way both medium are built and developed and the ecosystem in which they evolve that mean that they will always behave differently as far as crowdfunding is concerned. Projects in EUR as their currency are ranked 4th, ex aequo with projects in Australian dollars. I would expect there is a significant margin of growth there. 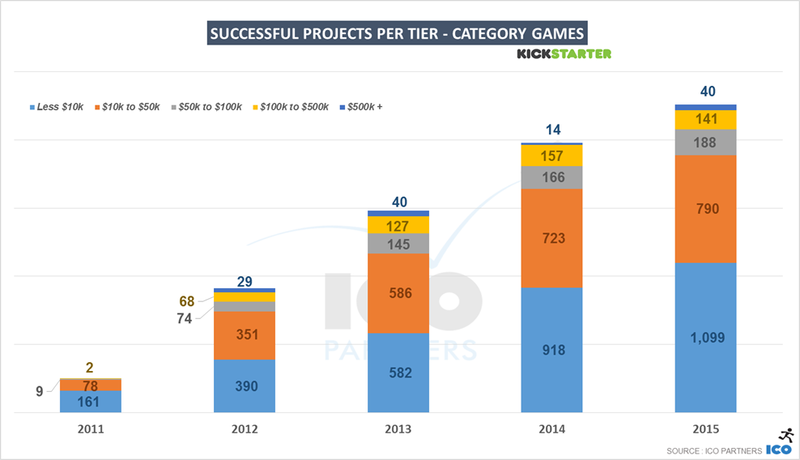 The junk ratio (proportion of projects that raised $0), while higher than the one for boardgames, is quite under the average you see on Kickstarter (20%). 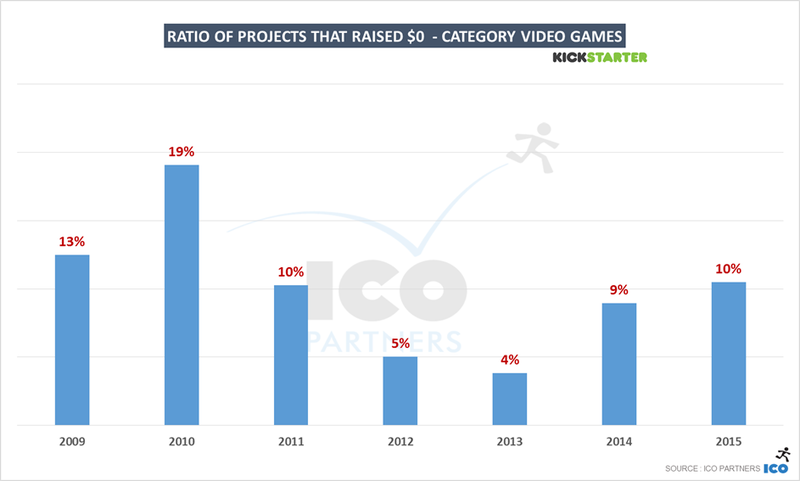 And even there has been a significant increase in the number of projects suspended by Kickstarter, overall the subcategory has not a massive amount of those. As a conclusion, despite seeing a larger amount of money being raised for video games, I would put 2015 at the same level as 2014. 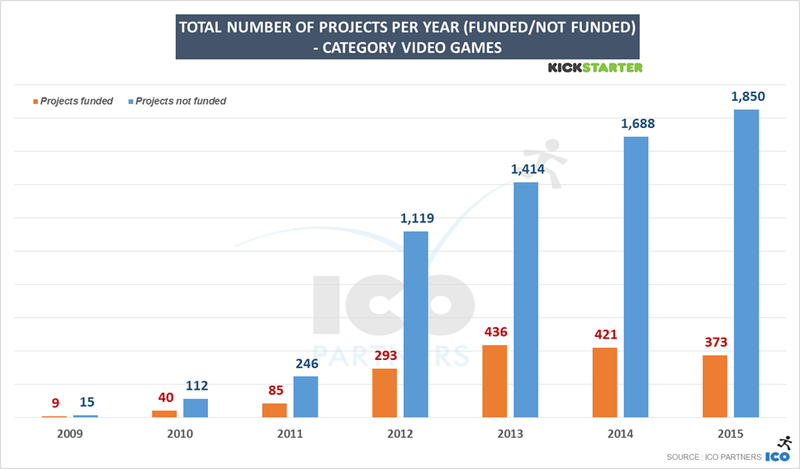 There has been a small decline in the total number of projects being funded – no bubble bursting here IMHO – and opening up to more European countries didn’t have any significant effect for video games. 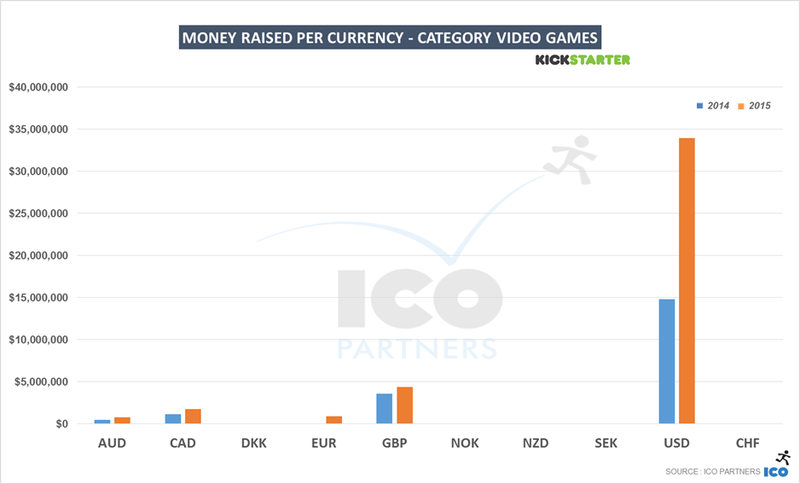 Overall, it seems crowdfunding for games get a bit more sophisticated, increasing the bar for funding, while still being a very beneficial process for the few projects perfectly fit for the model, such as were Shenmue 3 and Bloodstained last year. To finish this blog post though, I wanted to share 3 projects, currently live now, each one quite original, all of them with an art direction I particularly appreciate, and that I hope you will find interesting. If you do, you can back them of course, but more importantly share them around. Last time, I went over how a campaign should plan its stretch goals and communicate about them, but I didn’t say much about the nature of stretch goals themselves. So it is time to discuss that. And before I go into my thoughts on the topic, I think this requires an extra disclaimer. While I have a strong opinion about how stretch goals should be planned and announced, the nature of stretch goals is a much more complex topic, one where the nature of the game, the profile of its communities, the capabilities of the studio play such big roles that it would be hard for me to establish rules the way I did in the previous piece. For this reason, take all of the below as general guidelines and if anything feels inappropriate or odd for your own project, it is probably because it is and you should ignore what I say. On with it. Following up on my medium.com piece on the Yooka-Laylee campaign, I feel there is a need for a dedicated blog post on the most common mistake I see on crowdfunding campaigns, both large and small alike: the management of Stretch Goals. For those who are not familiar, Stretch Goal is the terminology now commonly used for the additional goals creators add to their campaign for actions and features they will implement once they raise beyond their original goal. 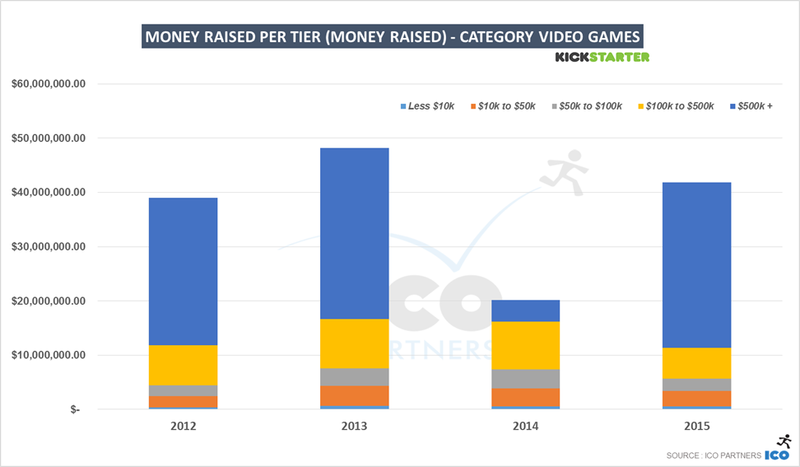 They became more and more common as crowdfunding soared in popularity. I believe their origin lies with the tabletop campaigns, where adding new rewards to a campaign became a popular formula to expand beyond its initial objective. The first campaign I saw use this very efficiently was the original Zombicide campaign, which raised $780,000 in April 2012. Stretch Goals are not just creators trying to keep their campaign going strong after reaching its initial goal. There is also a strong demand from backers, who wants to see the project they support expanded on with the extra cash raised. The pressure to promise more content is very real and can become a very insidious trap. But more on that later. 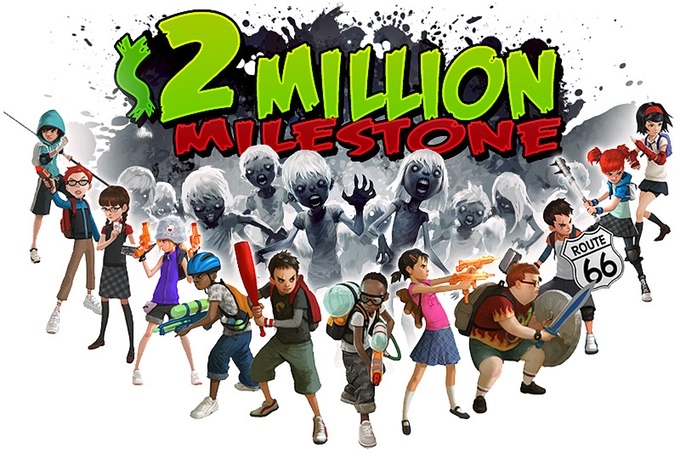 Zombie Playground was a campaign launched in May 2012, right on the back of Kickstarter’s first big wave for video games. It had its initial goal set at $100,000, and in the middle of that first wave, might have been deemed as easy to reach by the creators. From the very beginning, they set a series of Stretch Goals, that they called Milestones. 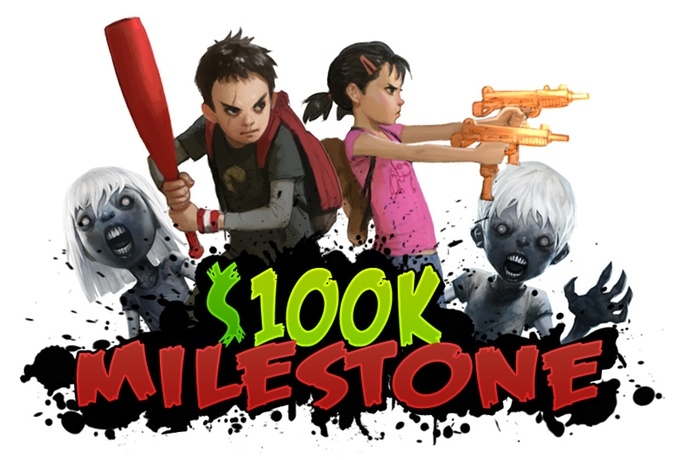 They had 5 Milestones, starting at $100,000 (for the basic pitch), to $2,000,000. The campaign didn’t go well (lots of reasons for that, you can read the updates if you are curious), and it raised “only” $167,000. If you follow this blog regularly, you know that raising more than $100,000 is not a small achievement for any campaign, but here, it was seen as a big failure by the backers… And rightfully, they were more than $1,800,000 short for the “complete vision” of the game. Like I said, this is an extreme example, but this is very true for any project with Stretch Goal announced from day one. Your campaign fails to raise its objective. The Stretch Goals you have announced are useless, and if anything they might have convinced some backers that the game they wanted wasn’t the one at $100,000, but the one you would do at $150,000 for instance. It might have convinced them you would not reach that goal and decided them in not backing you altogether. Following the 20/48 rule, you have shot yourself in the foot there. Your campaign is successful, but not by a vast margin. You might have reached your goal midway through, after the momentum of the first few days, and many people have moved on from your campaign to other things. While announcing you have reached your goal is a nice beat, announcing your Stretch Goal is not. They were already announced. If anything, you are inviting data-driven people to make their own back of the envelope calculations on your chances to reach those Stretch Goals, dismiss the ones they deem as out of reach. Re-igniting interest is difficult during a campaign, and you don’t have the announcement effect to help you here. Potentially, you have anticipated your success the wrong way, and all the Stretch Goals look out of reach to your backers and have no beneficial effects. Your campaign is widely successful. You reach your objective in the first few hours of the campaign. You might have suddenly passed through a number of Stretch Goals that will now be taken for granted and provide no benefit to your campaign promotion. The pacing you have set for your Stretch Goal might be very off – there might be too many small Stretch Goals that are too easy to achieve and you need to keep them coming (especially as you have set a precedent for them), or they might be spaced too far from each other and run into pacing issues. This is clearly the best problem to run into, but again, you leave yourselves in a situation where you lost control of an important aspect of your campaign. There is simply not a scenario where you benefit from having your Stretch Goals at the beginning. The objective at the beginning is to keep all the focus of the early campaign to be on the initial goal, and the initial goal only, and to keep Stretch Goals as new beats to keep the momentum of your campaign. There are backers that will always be asking about them. Some will in fact demand them, holding their precious pledge hostage if you don’t promise X, Y or Z. And you know what? That’s fine… Tell them you are not comfortable discussing these things while your campaign is still not funded, and things will come in time. And if they don’t want to pledge now, they shouldn’t. Invite them to keep an eye on the announcements you do as the campaign advances (“Hey, why don’t you follow us on Twitter or Facebook to make sure you don’t miss when we announce the Stretch Goal to port the game on N64 as you have been asking?”). Let me give you some examples with a couple of current campaigns. The campaign was launched on August 6th and will end on September 11th. They are asking for €225,000 and have currently raised €156,000, and by all metrics, this campaign is going well. For a €225,000 campaign, they already have announced Stretch Goals going up to €725,000; and the goals range from €50,000 to €125,000 each. The campaign is probably going to settle around €7,000 on average per day, taking them 10 more days to reach their initial goal (likely a bit less as getting close to the goal usually helps a campaign). Then, with 15 days to go, they will likely reach 2 or 3 Stretch Goals. They won’t go to the point where they will reveal those goals 06 and beyond. They are missing out on announcing what the most exciting Stretch Goals are going to be. 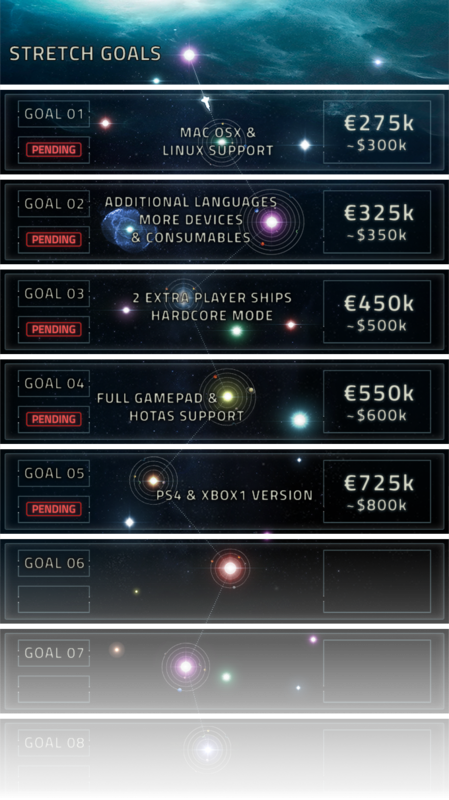 Holding on their Stretch Goals, they would have had been able to announce them mid-campaign, they also most likely wouldn’t have changed their goals in the first few days, as it would have given them some time to understand what were the most important requests from the community and plan accordingly. The campaign was launched on August 10th and will end on September 9th. They are asking for $5,000 and have currently raised $4,000. It’s very likely this meet its funding goal. At their current pace, they might raise $20,000, an excellent performance considering their objective. But if you look at those Stretch Goal through the lense of a potential backer, I cannot see them as positives. Why not wait for the game to be sure to have “better art” before backing it. Surely, the devs think their current project is going to be ugly if they phrased it that way? This is clumsy and the exact same plan could be a positive if only presented differently… Keeping the goals secret, to only announce the $10,000 “art boost” after you have reached $5,000, it suddenly becomes an awesome new feature, instead of an admission of sub-par art as it stands now. The project is also at a stage where it is not safe from sudden success. With such a “low” objective, a simple featuring in a large media outlet could take it beyond all those Stretch Goals in one instant. Not that it would be bad, but as you have to re-plan all your strategy for Stretch Goals in that instance, everything that has been announced cannot be used anymore as part of your plan. $10,000 to port the game to both android and iOS sounds incredibly low to me for instance. Concluded on June 13th this year, the campaign’s goal had been set at $500,000 and raised $5,545,991 after 33 days. They met all their announced Stretch Goals, all 27 of them. Passing all their initial Stretch Goals was a non-issue, they even gave away 3 Stretch Goals that had been unannounced at the time (showing generosity, as they should in such circumstances). But they only set 2 new Stretch Goals. After 2 days of campaigns, being at $1,500,000, it was obvious they would pass those in a breeze (they passed $2,000,000 on day 5). But they kept very much in control of the pacing and the promises made (something you need to be very careful about, it is oh-so-tempting to over promise during the high of a campaign). As you can see, the longest they went without a Stretch Goal being met was 3 days. They also didn’t meet multiple goals per day very often. This was limited to the very beginning, where they had momentum, the very end, where a huge additional momentum also happens, as well as on Day 16. You will notice I highlighted Day 12 to Day 16… These Stretch Goals are very interesting, they were for the 8-bit music Tracks. The Campaign broke down from its usual $250,000 on average per goal, to do 6 smaller Stretch Goals every $40,000 at that time. They could have easily packed them all together, but by breaking them down, changing the rhythm pattern at the moment of the campaign reached its slowest point, they guaranteed things were still happening at a decent rhythm. There is no doubt the team behind the campaign has very deep understanding of how crowdfunding campaigns function. An excellent addition to a campaign, as long as you have the critical mass to make it work (I wouldn’t consider it for a campaign raising under $500,000). Enough looking at others, how should you plan your own stretch goals? Your campaign is going to make it, but just about. You don’t need any stretch goals in that case. Or maybe one, to announce towards the end, in case the last couple of days go very well. 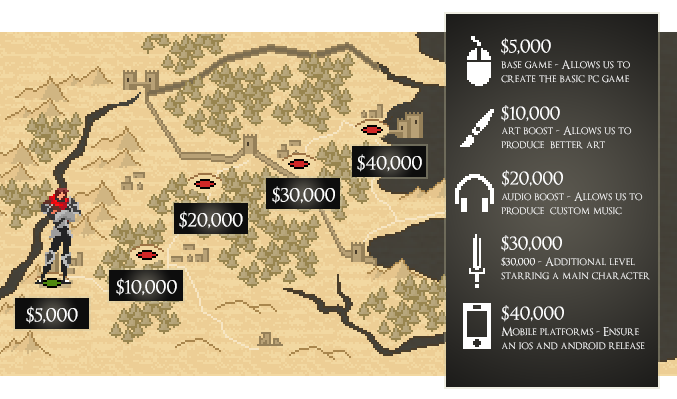 But this is a scenario you should look at outside of considerations with Stretch Goals. If you just make it, will you be able to make the game you promised? A very very important question to ask yourself, throughout your planning phase. Your campaign gets funded, but only mid-way through. Your Stretch Goals need to account for the fact that you are going to be in the mid-campaign “death valley”. You probably need those Stretch Goals to be relatively small, in order to meet some of them before the end, where you may want to have one a bit more ambitious, counting on the last days momentum to meet it. Your campaign is funded in a matter of hours. Hurray. You have the best problem in the world. Plan to have a few nice Stretch Goals that you can easily give right away, and more planned to space nicely along the rest of the campaign. You probably want to have Stretch Goals of different (financial) sizes, that you can swap around as you announce them to fit with the current rhythm of your campaign. Armed with those 3 strategies, keep them close by, and see what happens at launch. And adapt. One of the great strengths of a crowdfunding campaign is the actual feedback you get from your backers. Your well thought out plan might be going to the gutter when the initial feedback for Stretch Goals is not about a port for your game to the N64 as you had planned, but to have more hats added to the game. By planning well you can rebound more easily. As you can reshuffle what you had planned, and be more prepared in terms of budget estimates if things unexpected get massively requested. This said, this is an ideal scenario. One that doesn’t account that each campaign and each game is its own unique snowflake. There are many games that don’t have a lot of flexibility in terms of what you can add to them, and the granularity at which you can go. Narrative games for instance, don’t lend themselves for that unique hat for in-game characters that only backers can have. This is the kind of thing that will get you further in a multiplayer game though. You may want to add extra chapters for example, but those don’t come cheaply. It is important to embrace your game identity and make sure everything you promise during the game fit its nature. Let me illustrate this with the Strike Suit Zero campaign, that I collaborated on. The campaign was very specific. It was put together not to fund a new game, but to finish one already in production. Because of this, we had some very specific constraints: we couldn’t add any Stretch Goal that would compromise the release date. And because the game was already relatively advanced in production, adding new content wasn’t an option (we had already added some risks there with some of the rewards for the backers). The Stretch Goals for the campaign we couldn’t pace ideally, so they had to be quite chunky as it meant adding resources outside of the core team who were working on delivering the game. The studio ended up meeeting its objective mid-way through the campaign, and missing its second Stretch Goal not by much (the Mac and Linux versions were done in the end though). There was just no margin of maneuver by which Stretch Goals could have been added in a more granular way at the time. And that’s okay. The main goal was to fund the end of the development, and that happened. Stretch Goals are now seen as component of any campaign. I spend a lot of time discussing with creators about to launch their campaigns, and they all have them planned out (even if too many of them also plan to explain those extra goals from day one). But… it doesn’t have to be. Some projects are very complete by themselves, and it shouldn’t be a mandatory step in your campaign if that’s the case. Exploding Kittens had a great approach to this. 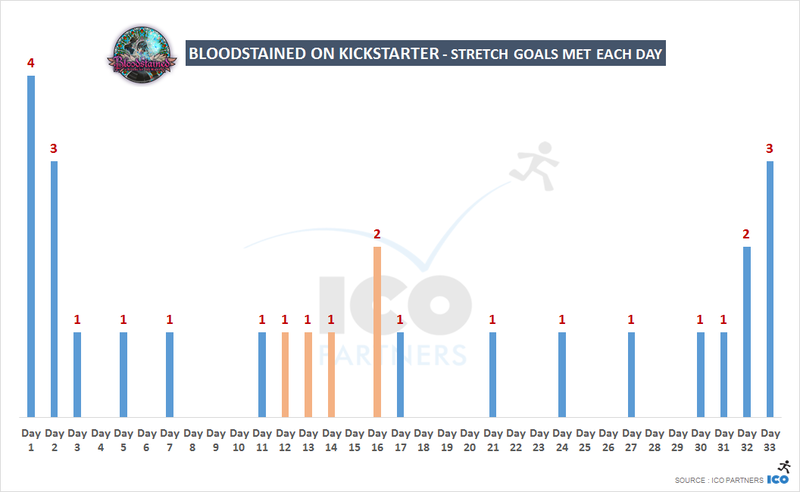 They blew their goal almost immediately, they were very happy they could make the game they had been working on, and just didn’t care about Stretch Goals (they went with a campaign achievements system, which Bloodstained’s took inspiration from). And some backers might get angry about this, the logic being “the money you get from the campaign should go towards making the game”, but that’s simply not true. If you set the right goal, that’s what should go towards making the game. Everything extra, you can dispose of the way you want. Stretch Goals will get you further money-wise, but also will make you commit to more development. Ponder what you really want to do, and choose your battles wisely. Sometimes, less is more. Don’t announce any stretch goals. Be humble about your initial goal, be focused on the early days of your campaign. Don’t feel like you need to have Stretch Goals because everyone else have them.